Life in Fort Lauderdale is wonderful, full of warm weather, palm trees and beautiful blue ocean. The price we pay, though, is accelerated aging due to constant sun exposure. Accelerated aging can cause deeper wrinkling to take hold sooner, spots and lesions that may become cancerous later, and leathery unhealthy skin that can’t do its job of protecting you from disease. That’s why regular skin treatments are so important. What if we told you that you could get three facial treatments in one session? With Triniti, it’s possible! The triniti skin series combines effective technologies for color correction, fine wrinkle treatment and deep wrinkle treatment to give you total facial renewal with minimal discomfort and downtime. Your triniti treatments begins with our Color Correction treatment. By utilizing a combination of bi-polar radio frequency energy and laser light energy, we can penetrate deep into the skin and begin to heal you from the inside, out. Next, we move on to ReFirme for fine wrinkle treatment. Collagen and elastin depletion in the skin result in the loss of volume, creating the skin sagging we all dread. The ReFirme procedure stimulates your body to begin reproducing that collagen as well as tightening the collagen you already have. This results in immediate and long-term skin firming. Finally, the Matrix IR applicator is used to non-invasively treat your deep wrinkles. By once again using the combination of bi-polar radio frequency and diode laser energy, we penetrate deep into the dermis to trigger your body’s own healing factors and collagen production. 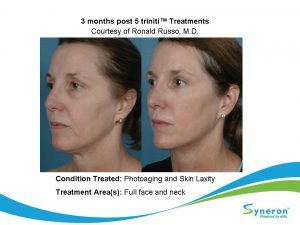 With the triniti treatment, you can see the benefits of three different procedures without having to spend the extra time, money, or downtime! Improve skin color, texture and wrinkles on you face without surgery – with 3 treatments in 1 session. The triniti series combines three of today’s most effective technologies for color correction, fine wrinkle treatment and deep wrinkle treatment to achieve total facial renewal with minimal discomfort and downtime. 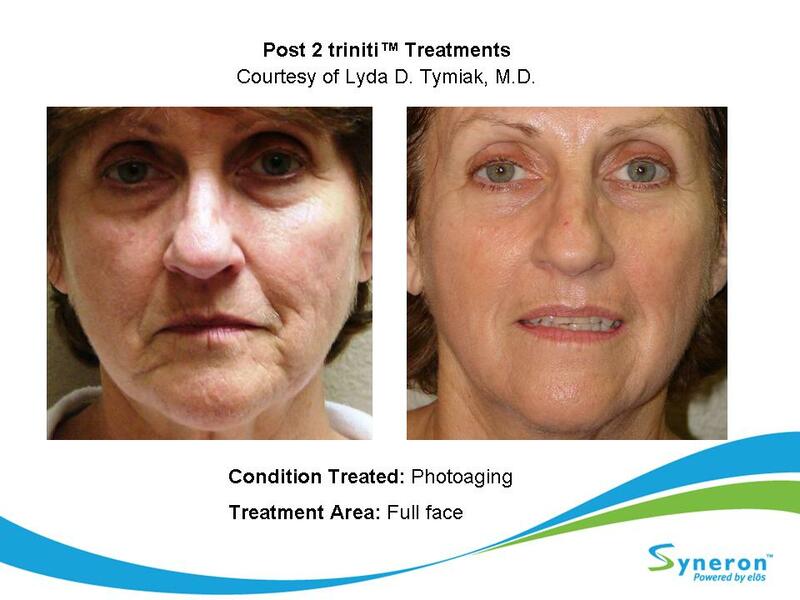 Color Correction – Treat spider veins, age spots, uneven skin tone and sun-damaged skin. 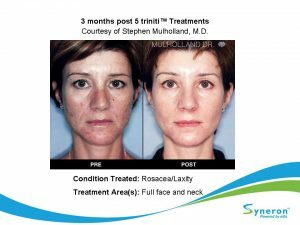 ReFirme® treatment – Target the telltale signs of aging, around the jowl and neck, under the eyes, brow lines, and nasolabial folds. Matrix IR™ fractional wrinkle treatment resolves wrinkles and skin texture becomes smoother. 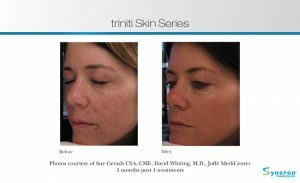 What is the triniti™ Skin Series? The complete skin program for immediate, visible and long lasting results, triniti™ is a non-surgical treatment in three steps, performed sequentially, during the same office visit. 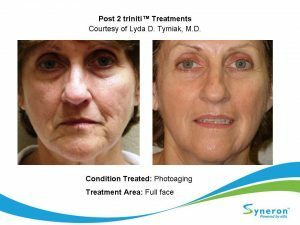 With the triniti skin program, color correction, and wrinkle treatment can all be achieved in a single session, helping you achieve total facial renewal in just 3 treatment sessions! 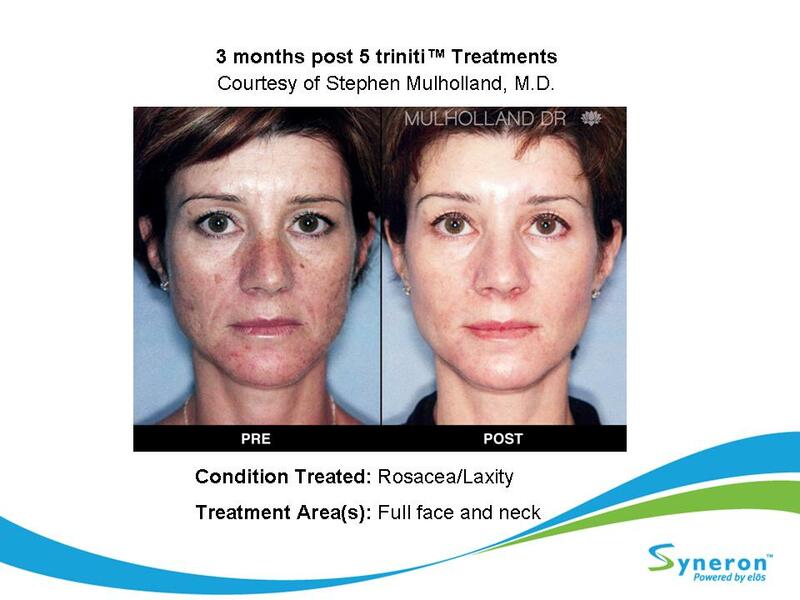 The triniti Skin Series combines 3 of today’s most effective technologies. Sublime wrinkle reduction targets tellale signs of aging, including: sagginess under the eyes, saggy brow lines, and nasolabial folds. The 3 treatment technologies of the triniti skin series feature combined bi-polar radio frequency and light energies which precisely heat tissue within the targeted treatment area to stimulate improvement within the skin. triniti saves time compared to other treatment programs. Typically three to five sessions spaced three to four weeks apart are performed. One touch-up session may be needed every six months. Most patients easily undergo the procedure. In addition, topical anesthetic cream and external cooling can be used to increase your comfort level. Most patients return to normal activities immediately after treatment. Most people see a gradual and continual improvement over the course of their treatments. During your initial consultation, your medical practitioner will personalize your treatment schedule for maximum results. Treatment is safe and effective for most skin types and skin colors. Total triniti treatment time is 40–60 minutes. If the neck is also treated, allow an additional 15–30 minutes. Typically three sessions spaced three to four weeks apart are performed. One touch-up session may be needed every six months.